Great academic philosophers love to write about sports. It gives them an opportunity to opine about issues that average people care about. Why must you follow the rules of the game? Do accomplished baseball hitters or cricket batsmen think before they swing at a ball or is it a purely instinctive and reflexive action? These are not profound questions about life and human satisfaction, but they can be fun to consider. Any scholar who engages in such a circumbendibus faces twin hurdles. Drafting a dense philosophical discourse may limit readership to a cluster of academic colleagues. That would not be engaging at all. Alternately, a philosopher can venture down the popular path making his or her analysis accessible to all. This latter scenario is the road Professor David Papineau has followed in Knowing the Score. There are stumbling blocks along this roadway, and Professor Papineau seems to have stumbled over most of them. David Papineau is a distinguished academic philosopher with nine books to his credit. His work on subjective consciousness and the physical brain is widely regarded. He holds teaching appointments at both King’s College London and the Graduate School at New York’s City University. He also loves sports, a passion evident in his writing. Papineau attempts to describe accurately the “rules” of the game. Do they include not only the written formulations, but also understood, but unwritten, conventions of the game? The same issue has arisen in legal cases involving injuries suffered during sports competitions: Should a defendant be held liable simply because he made contact with the plaintiff in violation of the written rules? Papineau does not address the abundant precedent on this issue. Papineau attempts to broaden his readership by using examples from both U.S. and U.K. sports that he has played as an amateur. This route runs into some difficulties. British readers will have no idea what to make of the author’s baseball examples. Similarly, his cricket and rugby illustrations will be worthless to American readers weaned on football, baseball and basketball. It is hard to master the sports of two nations. Papineau is fluent. His readers may not be. In his third section, Papineau addresses an issue that has puzzled generations of writers about sports: Why do we become fans of particular teams? He uses two examples: Yankees versus Mets and Arsenal versus Tottenham. All his readers will find at least one of these illustrations familiar. But what happens when there are two hometown clubs as in Chicago, Los Angeles, the San Francisco Bay Area, and, of course, New York? The author picked the Mets over the Yankees after attending games in both stadia and finding Citi Field more comfortable. Those who grew up as fans of the Yankees, especially during the various eras when the club was a perennial victor, will not likely change adherence. The Mets, of course, have a long history of mostly failure. Those who rooted for the Dodgers or the Giants before they left town for the West Coast likely have adopted the mostly woeful Mets. Papineau’s approach based on atmospherics will not change that outcome. 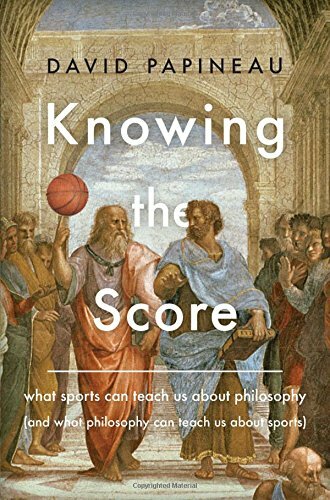 Professor Papineau’s Knowing the Score is not a great book on the philosophy or sports, but it is well written with interesting illustrations of the various sports-related issues it addresses. It is worth the attention of those who seek the right questions to ask, even if the author’s answers are not completely satisfying.